I was thinking about how different my life looks than I imagined it as a child, or as a teenager, or as a young married. Sure, some of the big things are what I hoped...I'm a wife, I'm a Mom. I write regularly (though, it's still not my job...yet.) But the road that led me to this place has been drastically different than I could have imagined. I never would have imagined that I would be a foster Mom, or adopting a teenager.t. I never would have imagined that I would write devotions for our church, or be scheduled to preach another sermon. I never imagined that I would be surrounded by friends who believe in me far more than I believe in myself, and don't allow my halting insecurity to stand in the way of my callings. 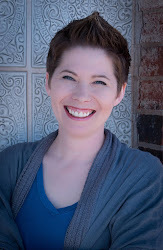 I never imagined I would consider going to seminary, or launching into pastoral care ministry. I was driving with my daughters in the car the other day. I needed to stop at a gas station to fill my tank, and I needed to take them to school. I knew at that time of the day that traffic on the main road would be a mess, and it would be better to take the quieter back road. As I made the turn leaving the gas station, my six-year old protested. "Mom, you're going the wrong way! This takes us back home! This isn't the right way!" I (not so gently...because I'm very much a work-in-progress) reminded her that I'm the Mom. I know the best way to get there, and she doesn't drive yet, so she's not familiar with all the roads. And suddenly it hit me, that I do the same thing to God. I look at the moment by moment, and sometimes ask, "What are you doing, God?! We're going the wrong way!" because in my humanity I don't see the rhyme or reason. I can't see the long road, and I don't see my own life through the lens of eternity. 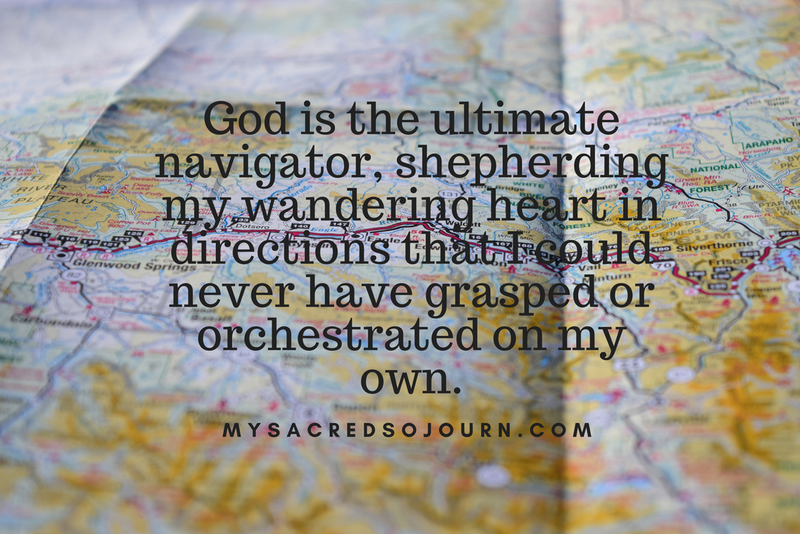 God is the ultimate navigator, shepherding my wandering heart in directions that I could never have grasped or orchestrated on my own. 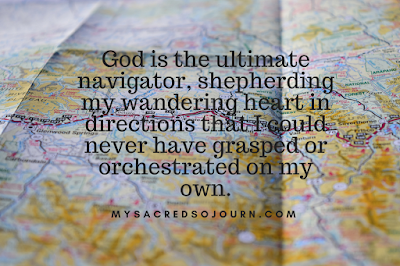 Most of the time, the story he's writing isn't seen in the day-to-day, but it's clearly seen as I look back and notice all the details that he expertly organized to lead me to the exact place he wanted me. I only see the road map in hindsight. 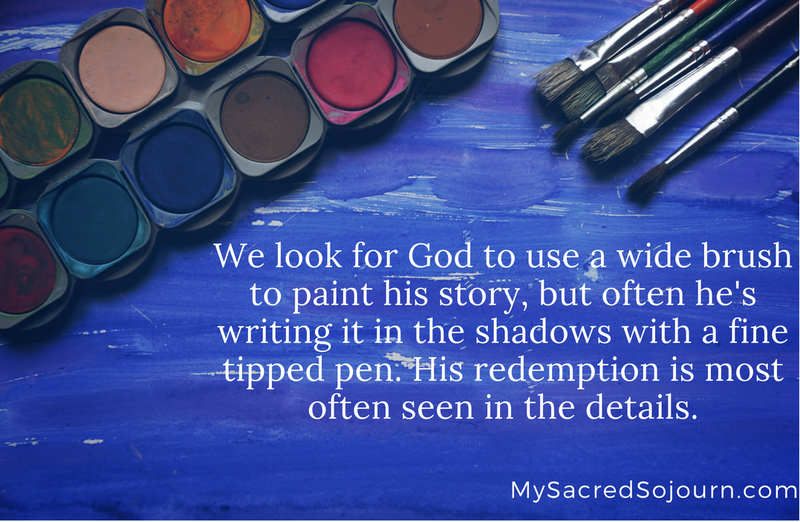 So often, we look for God to use a wide brush to paint his story, but often he's writing it in the shadows with a fine tipped pen. His redemption is most often seen in the details. Where I want his plan laid out in skywriting and fireworks, he's whispering it quietly in my heart, or sketching it out in the shadows where it can be difficult, even impossible, to see with my human eyes. My vision can be so dark. And when my vision fails, there is only one thing left to pray. Be thou my vision, O Lord of my heart. 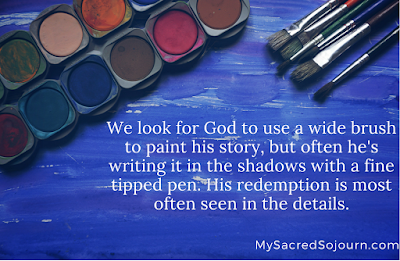 Let me see the story you're writing, and if I can't see it, let me simply trust that you are there, in every detail, working all things for my good because you are all good, all the time. Let me simply trust you as the ultimate story-writer, the best navigator, and the ultimate visioneer for my life. 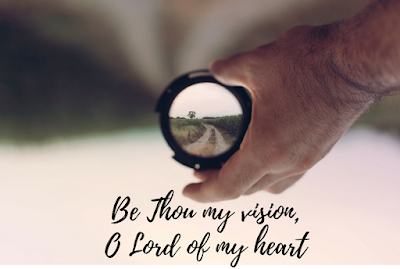 Be thou my vision, O Lord of my heart. Be thou my vision.